The Isles of Scilly, just 28 miles from mainland Cornwall – jewels in the Atlantic Ocean – it’s hard to believe that you are still in England. You can fly from Exeter, Newquay or Lands End but this year, as in 1976 for our first visit, we decided to travel on ‘Scillonian III’, the ferry link to the islands. It’s not everyone’s favourite mode of transport to Scilly as ‘The Scillonian’ has a reputation for being inhospitable to some of its passengers during rough weather! Whichever method of travel you select, arriving on Scilly takes you back to an England of many years ago. Life runs at a much slower pace on all of the five inhabited islands. St Mary’s is the main island of the archipelago with its bustling town and harbour. 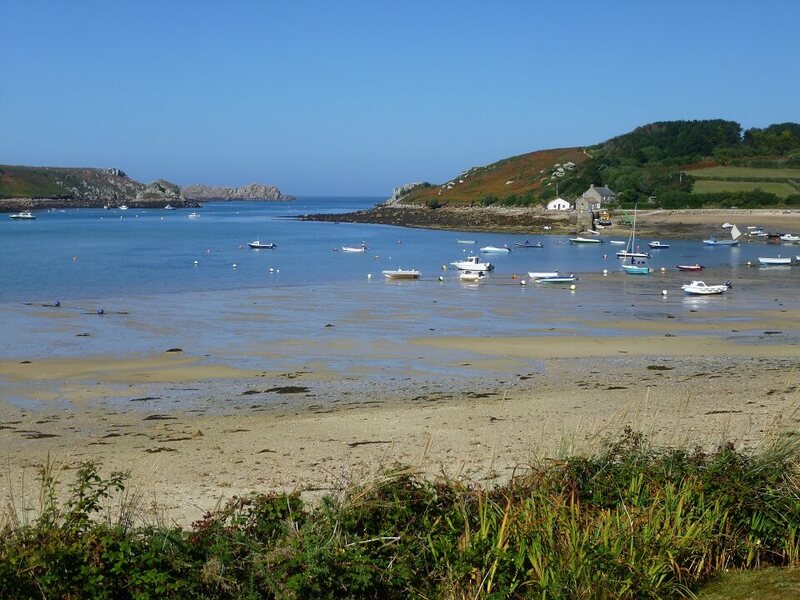 St Martin’s boasts beautiful beaches, St Agnes houses England’s most westerly pub, Bryher has its own wild and rugged personality. Tresco is well known for its Abbey Gardens containing plants from all over the world and more recently, new inhabitants – red squirrels! Trips to the ‘off islands’ run daily, courtesy of the inter island launches, giving you the opportunity to walk, bird watch, sun bathe or swim if the weather is good. Beware though – the crystal clear water is cold whether it’s winter or summer – usually about 18 degrees or so! On a good day you can sometimes take a trip out to the Bishop Rock lighthouse, 6 miles from St Mary’s, or visit the idyllic uninhabited island of Samson, where the beaches are stunning. My first trip to Scilly was in 1976. For those who remember the long hot summer of that year, we had the last four days of it before the rains came. We were totally unprepared, with inadequate clothing and in particular, inadequate waterproofs! Fast forward almost 40 years and having discovered Rohan, packing for Scilly has become so easy. This year we stayed on Tresco. I travelled in my Roamers and packed another pair, just in case of rain. The boat trip can be chilly if you sit out on deck, so I wore my Shivling fleece, together with my bright red Cloudcover coat which was my very first piece of Rohan clothing. Having been made redundant in 2011, I decided to treat myself to some ‘proper’ walking gear and my bright red jacket was the first piece, with my husband being treated to a green one! My holiday wardrobe is a simple one. I love my Essence T’s which I now have in various colours and usually take some chunky jewellery and a couple of colourful scarves to dress these up for that evening at the pub. A couple of long sleeved Stria tops teamed up with my Pathway Cardis keep the evening chill off when needed. I also take my Icepack body-warmer which is great for days when the wind is rather chilly. My Icepack jacket might go along next year too – it hasn’t been to Scilly yet!